I spent a few years in the 49th state while growing up, but for some reason never realized what a titanic place it is. Kind of ironic considering most things seem downright massive to a kid. Perhaps it’s because I lived near Anchorage, whose population is large enough (just shy of 300,000 inhabitants — 41% of the entire state tally!) to provide the look-and-feel of a major American city. It’s also blessed with temperate weather due to the comparatively low latitude and coastal location. But that’s all on top. 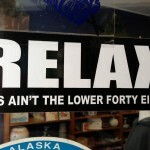 Truth to tell, once you get out of the “big city”, it quickly becomes clear that Alaska is a place of extremes. The mountains, the temperatures, the fuel and food bills, the natural resources, the isolation, the beauty, and of course the physical size of the state itself are larger-than-life. Even going to a restaurant was an exercise in extremes; one of our favorite joints was a steakhouse that served such a large slab of meat that if you could finish it, it was free. I never made it under that limbo stick. Alaska has a lot in common with Texas, come to think of it. Big, wide open spaces, a thriving oil industry, and a proud, much-deserved reputation for self-reliance. Back when I lived there — the early-mid 1980s — there were plenty of Texans in the area because of the new pipeline which was bringing crude oil from the Northern Slope to Valdez for shipping to refineries in the lower 48. The locals always knew how to get a Texan’s goat: tell them that someday we’d split Alaska in two, thereby making Texas the third-largest state. As I recall, they didn’t like that very much. Like I said, a land of extremes. The water’s blue color is from glacial silt. 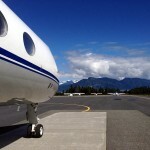 Anyway, since I started flying the Gulfstream, I’ve been back to Alaska several times. 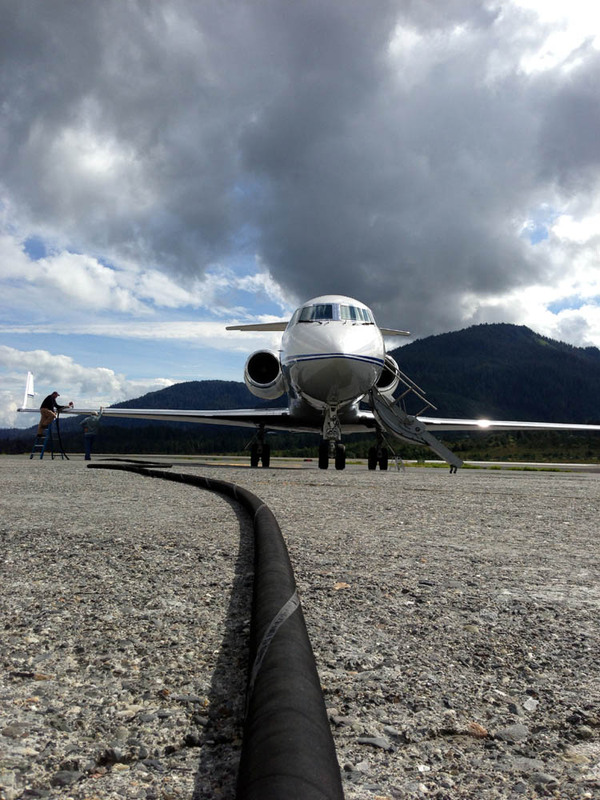 Anchorage is a frequent “tech stop” for fuel before launching off to Asia. 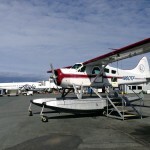 I’ve also done a pair of crew swaps in Nome, and most recently spent a few days in southeastern Alaska on a charter trip. 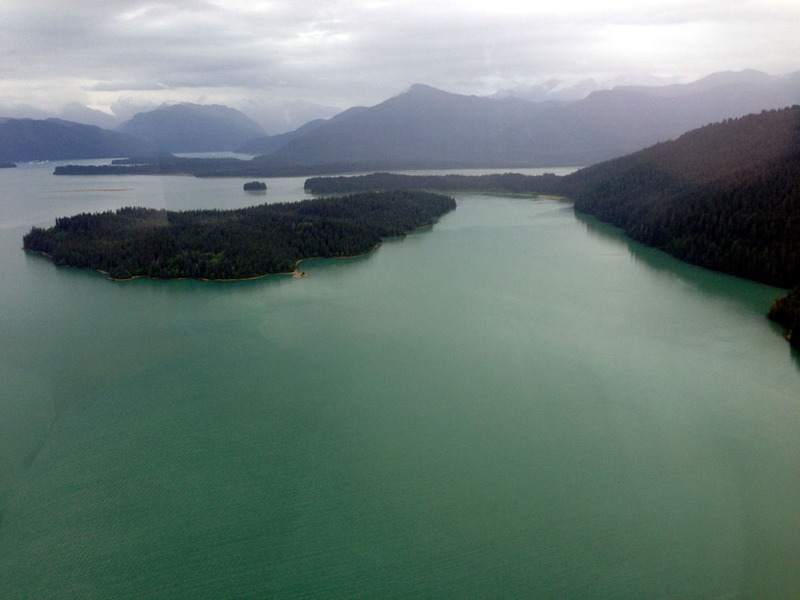 We were scheduled to fly into small fishing village near Juneau, but pre-flight planning determined that most of the instrument approach procedures in that part of the state had just been NOTAM’d as “Not Authorized”. An interesting turn of events, to say the least. Alaska’s weather more often than not dictates the use of an IAP to get on the ground when you’re flying a turbojet, but suddenly most of them were stripped away. The only one still available was a localizer approach which featured a DME arc and a 65 degree offset between the final approach course and runway. 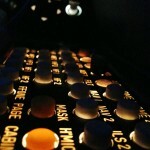 This approach also featured my first live experience with the “inverse C” symbol on the Jepp chart. If you’re not familiar, this symbol indicates the use of new circling minimums for the procedure. I wrote about this several months ago, presciently noting that “increasing the circling radii will often have the effect of raising the Minimum Descent Altitude, and that could make the procedure less valuable.” In this case, our circling minimums were 3,100′ AGL, so we literally needed VFR conditions to land. 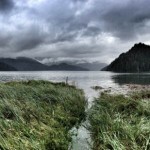 As anyone who’s been to southeast Alaska will tell you, that kind of weather doesn’t occur too often in the region, and this day was no exception. Despite good visibility underneath the layer, we never broke out and after a textbook missed approach procedure, diverted to Sitka where the weather was VFR. The FAA had recently NOTAM’d many of the approaches in the area as out of service due to a magnetic variance in the region. 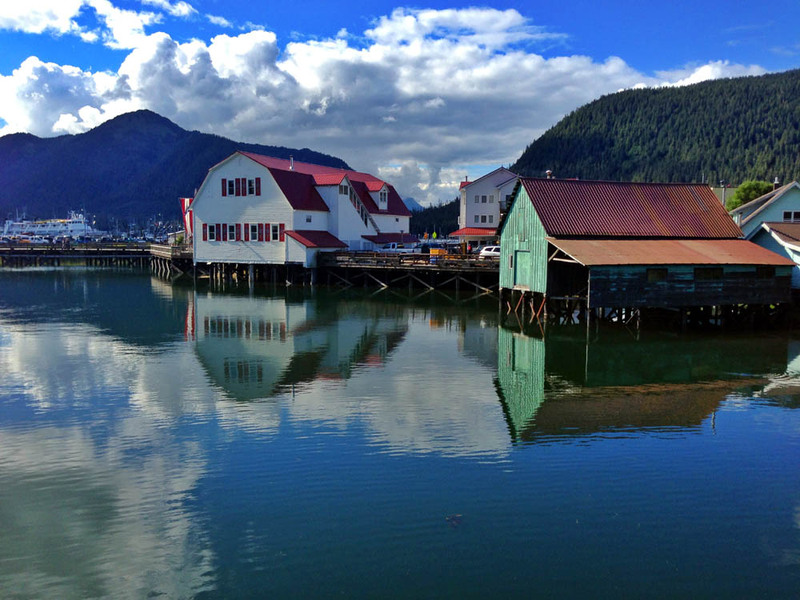 As the state’s fourth largest city, Sitka boasts a massive population of 9,000. 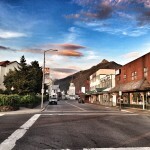 Even a blind man would identify Sitka as a fishing town due to the persistent smell of fish throughout the area. It’s not unpleasant, especially when mixed with the scent of salt air, but is definitely a sign that you’re “somewhere else”. The airport features something wholly unfamiliar to most pilots these days: an on-site Flight Service Station. I had to think long and hard to determine whether I’d ever even been inside one of them before. I believe the answer is “no”. The lone employee working the facility enlightened us about the area’s approach procedures; they were NOTAM’d out of service because the FAA discovered a magnetic variation in the state’s panhandle. 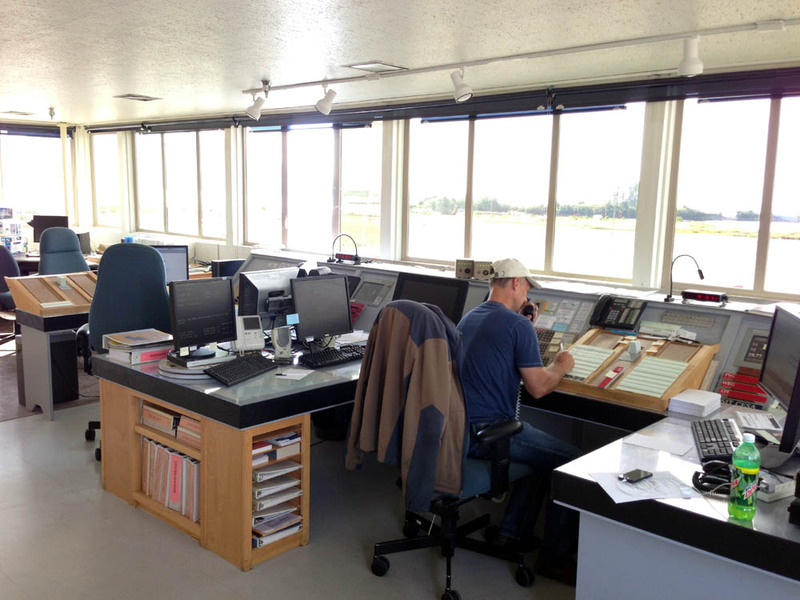 Few of today’s pilots have seen this: it’s the interior of a flight service station! If you want a clearance here, just walk inside and pick it up. As if this wasn’t enough, that day the list of banned procedures had grown significantly, and now included most of the departure procedures. Apparently this was causing havoc with lifeguard flights because without those departures they needed VFR weather in order to take off. While I understand the significance of magnetic variations on some IAPs, it was frustrating to see the satellite-based procedures cancelled due to this phenomenon. 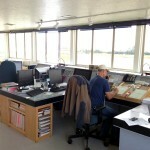 Wouldn’t a NOTAM announcing the variation be sufficient? I was motivated to ask this question after seeing Alaska Airlines 737s coming and going from airports in IFR conditions. A fueler told me that they have their own custom, FAA-approved instrument approach procedures. So while the air ambulances were grounded, the airline soldiered on without a care in the world. This suggests a “red tape” situation more than a serious problem with the approaches. It’s probably driven — like most things these days — by liability concerns. The FAA is responsible for the approaches we were flying, whereas Alaska Airlines is the accountable party for their procedures. 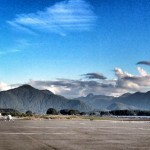 The next day, we repositioned the airplane to Petersburg, a short 100 nautical mile flight from Sitka. 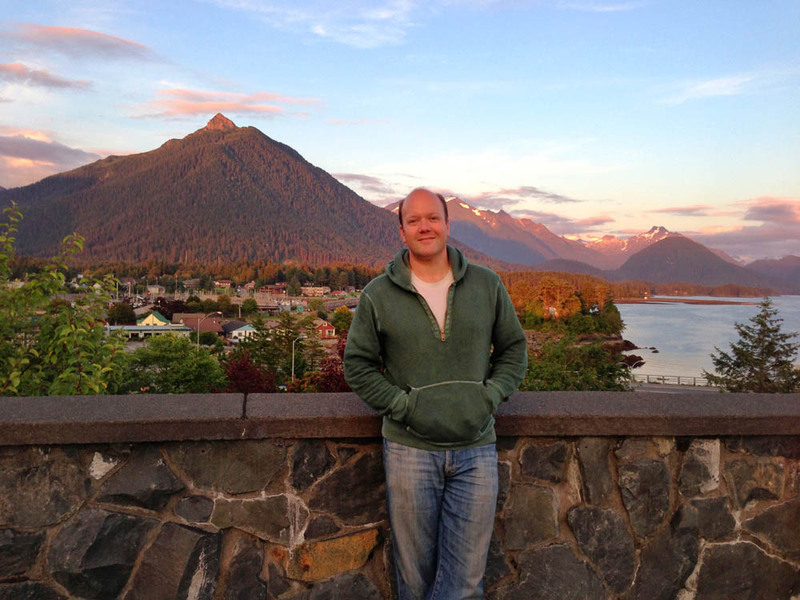 With only 2,800 residents, Petersburg is even smaller than Sitka, but differentiates itself from the latter with a strong Scandinavian character. 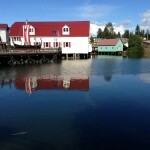 The town was founded by Peter Buschmann, a Norwegian immigrant who started a cannery there in the 19th century. 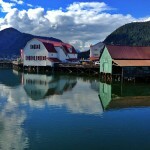 The village evolved into a successful fishing center due to the nearby LeConte Glacier icebergs, which provided a method of cooling the fish. Even today, it is one of the most successful fishing towns in that part of the world with huge hauls of salmon, halibut, black cod, king crab, tanner crab, and herring. Petersburg is sometimes referred to as “Little Norway”, and boy does it look like it! In fact, I saw more Nordic flags than American ones on display in town while we were there. Every year on May 17th they celebrate Norwegian Constitution Day and hold an annual festival in honor of their Scandinavian heritage. Apparently they celebrate it longer and more boisterously than in Norway! Petersburg is a town with major Nordic connections. You’ll see it in everything from street names to architecture. Alaskan towns are know for their high ratio of watering holes to inhabitants, but even by that metric, the folks in Petersburg know how to party! Perhaps it’s because the town sits on the northern end of an island which has no bridges to anywhere else and they have to make their own fun, but we were regaled with more than one story of legendary, alcohol-fueled hell-raising during the festival, including throwing an Alaska Airlines crew into the town jail just because they could. As with many such towns in Alaska, boats and aircraft are every bit as important — perhaps even more so — than cars and trucks. Petersburg’s airport is much larger than one would expect for a town of that size. 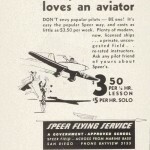 Even so, there was only one provider of Jet-A fuel: a helicopter operation run by a single employee. He answered the phones, flew the helicopter, did the maintenance, the whole works. Normally a Gulfstream is gassed up using a “pressure fueling” connection underneath the wing which transfers the fluid at a very high rate, but that wasn’t available here, so we had the not-unpleasant experience of fueling Alaska-style: with a traditional hose hoisted over the top of the wing through fuel caps that probably hadn’t been opened in 10 years. Over-wing fueling is so rare that we weren’t even sure the fuel caps were unlocked, or where they key to unlock them might be. Thankfully we had no problem getting the caps open. Over-wing fueling is much slower than pressure fueling. We added a thousand gallons and it took at least an hour and a half to move the plane into position, add the Jet-A (at a rate of about 15 gallons per minute), and then reposition the aircraft to a dedicated concrete pad designed to hold something of it’s significant weight. Adding a thousand gallons via over-wing fueling took about 90 minutes. Our fueler was extremely friendly. In fact, everyone we encountered in Alaska was pleasant and helpful. The locals might not notice it, but coming from Southern California, it was clear as day to me since, sadly, we don’t always see that attitude down here. It was obvious that they take pride in their work and are always on the lookout for ways to help strangers. When we needed ice for the galley, a guy on the airport offered to drive me to the market. When we couldn’t find a ladder to check the fuel caps, there he was again, lending a hand and offering us a meal from the barbeque they were preparing outside their hangar. The fueler was kind enough to not only do the grunt work of adding kerosene to our bird, but also offered to take us on a helicopter tour of the area since he had to reposition a logging crew from one place to another. Well we certainly weren’t going to say no to that! 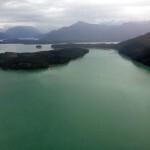 After a quick meal in town, we returned to the airport and departed on a spectacular flight over Spirit Creek, Wrangall Narrows, Summer Straight, glaciers, and various other inner passages of southeast Alaska. It’s one thing to see sights like this from the flight levels, but quite another to watch them slide by from just a few hundred feet above the Earth. If you want to see things up close and personal, a jet is not the right tool for the job. 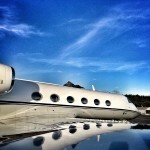 When we’re down low in the Gulfstream it’s almost always because we are in the process of taking off or landing, so our sightseeing opportunities are rather limited. 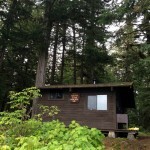 Anyway, our intrepid pilot dropped us off in the midst of Tongass National Park, right next to a tiny U.S. Forest Service cabin on the edge of the Harding River. He zoomed away to move that work crew and left us free to explore the area for an hour or so. It’s moments like that that really make this job worth it. I looked around and couldn’t believe our good fortune. People pay thousands of dollars for the privilege of “getting away from it all”, and here I was being paid to do exactly the same thing! Nothing to do here but relax and enjoy communing with nature. That hour passed all too quickly. It seemed like just a few minutes before we heard the familiar sound of the rotorcraft’s blades beating the air into submission as our ride returned to pick us up. By this time the ceiling was down to 500′ overcast in light to moderate rain. Not something I’d typically fly VFR in. But then, this is Alaska, and we were in a helicopter, so it qualified as “better than average” conditions. It was one of those perfect days. We had just enough time to head back to our hotel, grab a nap and shower, and return to the airport — a three minute drive — to prep the jet for a smooth, pleasant flight back to the “lower 48”. As we streaked across the sky, eight-and-a-half miles above the earth, I looked over my shoulder at the slowly setting sun and hoped I’d be headed back to the Last Frontier again soon. If this is true, how come the ratio of men to women is so skewed in Alaska? These tiny little islands have homes on them! We saw them on final approach to the runway. 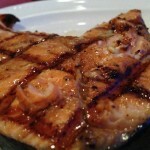 It’s antithetical to visit Alaska and not have a big slab of salmon. 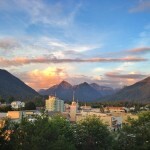 Sitka is Alaska’s 5th largest city, yet it’s population is only 9,000. On our way to dinner, we happened upon this scenic vista which looks out over the harbor and provides a great view of the city. 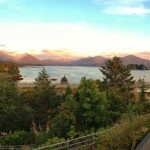 Sitka, like just about everything in Alaska, is nestled at the base of some steep terrain. My favorite time of day. And incidentally a perfect time for photos. You know you’re in Alaska when everything on the ramp is either a float plane, amphibian, tailwheel, or plastered with the Alaska Airlines logo. Big aircraft are instructed to park on this concrete pad due to their weight. Petersburg feels more like Norway than Alaska. Looks that way in many places, too. 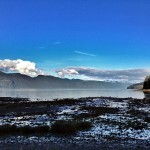 We walked a few miles to Frederick Sound, a popular hang-out for whales. 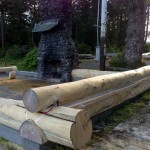 This log cabin was in the midst of being built by hand. The tide moves quite a bit here — as much as 35 feet between low and high, as I recall! Our pilot dropped us off along the Harding River at this little cabin in the middle of nowhere to do some exploring while he flew off to transfer a logging crew from one site to another. 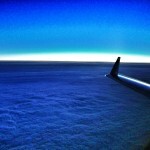 We departed toward the “Lower 48” into rainy skies and broke out on top, cleared direct to our destination. 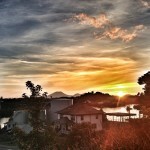 Nothing to do but watch the sun set in the distance! This audio panel is a button-pusher’s dream. 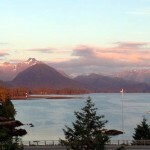 Sitka was settled 10,000 years ago by the Tlingit people. It may be in Alaska, but it’s quite far south and the climate is temperate. They don’t even get much snow. 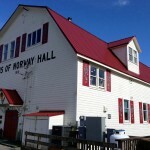 The Petersburg Little Norway Festival is held every May. They used to launch this boat into the water, but apparently the revelers got too out of hand one year and now it just stays on land. 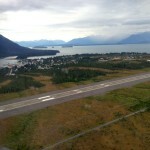 Petersburg, AK — population 3,000 — as seen on our descent into the airport via helicopter. Lovely story Ron! I have yet to make it up to Alaska and after reading your account, I can’t wait until I do. I can certainly see how folks are drawn to it. 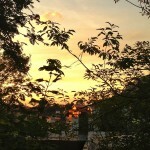 Ron – Thanks for sharing your story and those great images! 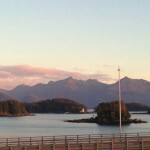 We cruised to Alaska about ten years ago and, while it was a great way to explore many of the natural wonders (at least those available near the inside passage), reading your account reinforced for how it insulated us from experiencing the people and culture. I was also interested in your account of the NA instrument approaches. Did you hear anything about the long term plan for those? 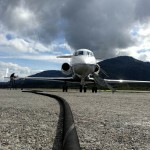 Considering the dependence of Alaskan towns on general aviation for supplies and transportation, it seems like this situation would be absolutely crippling. The local aviation community and the FSS specialist I spoke to were both in the dark about details, but the assumption was that the procedures would be NA until they were re-published with the new magnetic data and then flight checked by the FAA. I’m not sure if they’re in the process of doing that as we speak, but I assume so. I just looked at the FDC NOTAMs for that part of the state. Some of the IAPs are still unavailable, but it appears to be a smaller list than when we went up there. I was fortunate to have been “tour group leader” (Wrangell Mountain Air’s label) in 2008 with a neighbor to run two DC-3 flights of passengers to McCarthy/Kennicott on an overnight excursion for Cordova’s centennial, reenacting the Cordova Airlines excursions of the late 1950’s. I’m a part of history… Aren’t we all? We are indeed! Your air tour event sounds like it would have been a blast. Alaskan aviation is always an adventure. I’ve got a friend up there right now who’s always posting photos of him landing on the side of glaciers. What a life! Great story. Great pics. I am GREEN with envy. Thanks a lot for sharing. Ron, I did enjoy reading your article and the beautiful pictures. With 55 years in aviation working around the world I have seen some lovely places but Alaska is something special. I learnt to fly in tigermoths but kept flying as a hobby. I remember arriving at Anchorage for the first time by airline and seeing the llarge areas of car parks only to realise when we got lower that they are float plane parks – fantastic. I always wanted to add float planes to my PPL but never did, it always remained a dream. I love the idea of flying from lake to lake and fishing from the floats. My only concern would be the very large mosquitos which I experienced in Russia. I enjoy watching the TV programme – Flying Wild Alaska. Aviation is a great industry bringing people of the world together. Aviation people are a great family, whereever you go you find friends. You should go after that rating, Graham! It’s never too late. Besides, I’ve never heard anyone say a bad word about float flying. I’m rated but haven’t had much chance to put it to use. Those who do really seem to love it. A fellow CFI takes his Skyhawk out to Minnesota every year, converts the landing gear to straight floats, and spends the summer zipping around the countless lakes in that area. Always makes me #envious. I’ve got a student who just emailed me about seeing Row 44’s Grumman Albatross land in Long Beach harbor, said it was the coolest thing he’s encountered in a long time and asked if I knew anything about it. I replied that he should call the company and ask them if he could see it in person somewhere or get a ride. Normally that would be crazy talk, but because it’s aviation, there’s probably a real chance he’ll be able to work it out. Like you said, we’re a great family! Thanks for sharing your adventures Ron!! 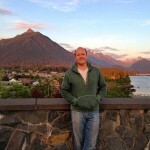 I learnt more about Sitka through your blog. The oil industry in Alaska is likely to thrive in the years to come, considering the increase in investment by leading oil and gas companies in this area. Boy, I’m getting old, though: I remember going into the FSS at SNA back in the ’70s. YIKES! 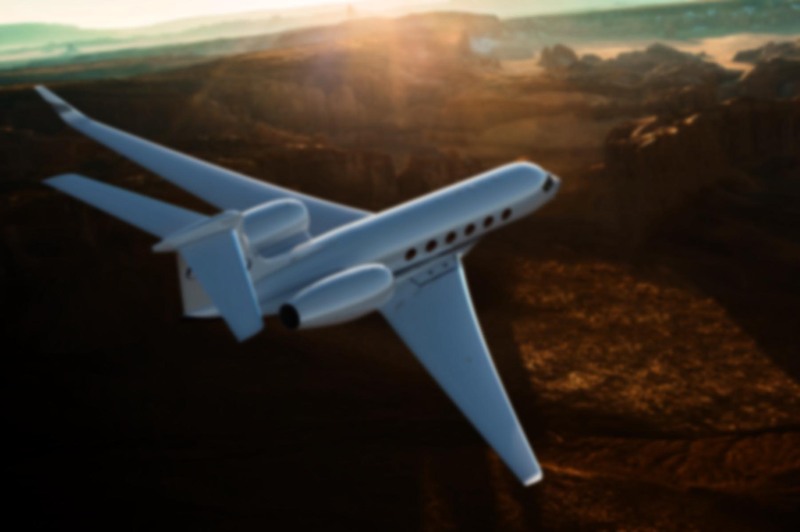 Well-played, my friend — I’ve never heard the Gulfstream referred to as “g-string”! Glad I could provide a bit of nostalgia for the “good old days”; I can see why people love it up there, especially if you’re coming to it from the hustle and bustle of a large city. The natural beauty, peace, quiet, fresh air… it can be addicting. And it comes without the severity of the northern slope’s extreme climate.